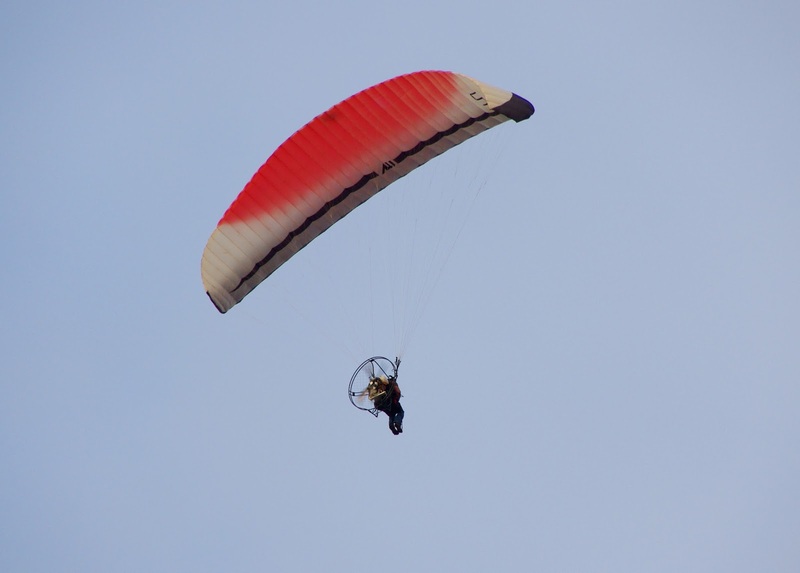 Spotted overhead my house in Westgate this evening, a motorised paraglider. These normally fly from a farm near Herne Bay but if you can put-up with the slow speed, they are a very civilised way of getting about and enjoying a view on a summer's evening. Pilots are somewhat wary of these man and a fan machines, if only because the people who fly them frequently, if not regularly, appear unconcerned by the danger from fixed-wing and rotary aircraft. if they climb above 1,000 feet in an area close to an airfield. While we are expecting a storm on Saturday, the heatwave looks set to return again on Sunday and in weather as good as this, I would much rather be outside enjoying the rare miracle of an English summer, than inside blogging for an audience that is quite probably outside having a glass of wine. For any aviation enthusiast, the BBC's One Show will be filming at Rochester airport from 0830 on Sunday morning. They were over at the Shuttleworth collection, near Luton, today, filming footage of the last remaining WWI flyable SE5A fighter for some historic background and there's an attempt to do something quite unique on Sunday morning if the weather permits. Blue skies required. This project has been a year in the planning with the BBC and nobody quite knows if we will be able to pull it off. It's still a bit of a secret but I will be taking my own cameras with me to record some of the behind the scenes footage to share with you later. I saw it circling over Westgate and wondered whether you'd bought a new toy? Saw them circling over Westbrook. Headed towards Margate and didn't see them come back. Bet they had a great view ! The A380 could do him some serious harm. It has been landing on runway 01 this week, from the direction of Herne Bay, and taking off from runway 28.